Vintage Vibe – exclusive interview! Simon Beck: Hi! I?m talking to Chris Carroll and Fred DiLeone from Vintage Vibe, a New Jersey-based company that has not only become one of the world?s top specialists in servicing and customising vintage keyboard instruments but has also recently started manufacturing their own electromechanical tine pianos to considerable critical acclaim. Chris, when and how did your business start up, and what were the first products and services you provided? Chris Carroll: Vintage Vibe started back in 1997 as a Vintage Keyboard rental company in Manhattan. We were ahead of our time with the Vintage thing. Unfortunately we spent more money on repairing the classic keyboards than we did renting them, so I spent some time perfecting the craft of repairing Fender Rhodes and Wurlitzers. A Manhattan audio repair centre offered me the opportunity to work with them as they were young and growing, I ended up running their keyboard dept. (previously they would do all of my electronic repairs on my gear). I ended the rental part of the business for the most part at this point. We became good friends and they taught me a lot about electronic trouble shooting. We would churn out repairs by the dozens. This was a real grind house experience. There are definitely more Wurlitzers and Fender Rhodes per square mile in NYC than anywhere. I was still operating Vintage Vibe at this point driving my van all around New York picking up and delivering keyboards to my customers. Fate had us all in for a change when on Sept 11th 2001 New York City was attacked. Chaos ensued and nothing was the same again. All businesses were heavily stressed and no one was spending any money. Business as we knew it was dead. Everything was cut down to part time and I had just had a son and needed to make more money. The time was right to make Vintage Vibe a full time vibe for me and my family. The first services I offered was door to door pick up and delivery with specialized tuning, voicing and amp repair. Our first product was making reeds. They were inconsistent but when you got a good one, they did the job. The true recipe for making reeds was years away at this point. SB: When did you start manufacturing reproduction parts, and what problems did you encounter in the process? CC: Oh, man this has been an ongoing project now for years. Probably around 2003 we started making reeds, inconsistently due to the wrong recipe. When manufacturing parts, there are always many factors to deal with: blue prints, vendor reliability, reasonable costs, marketing the parts for sale, public expectation, public perception on what parts should cost, etc. Sometimes vendors just do not get it and you do things over and over and you want to scream. SB: Is there much competition in the vintage keyboard repair and restoration business? CC: There have been times of competition and some struggles but most of us are all friends and can talk easily on the phone. Anyone who excludes himself from the community is dealing with an inflated ego. We are all in the same boat trying to play music, have a happy vibe and to support ourselves or our families. We are down to earth here and we love our friends and customers. SB: What have been the most interesting, challenging or unusual keyboards you?ve worked on? CC: Oh, back in the day, that would be a Mellotron or some Chamberlin tape drum machines. You would never catch me working on those these days. I also remember working on some Claviolines or Solovox?s as well as some Optigans. 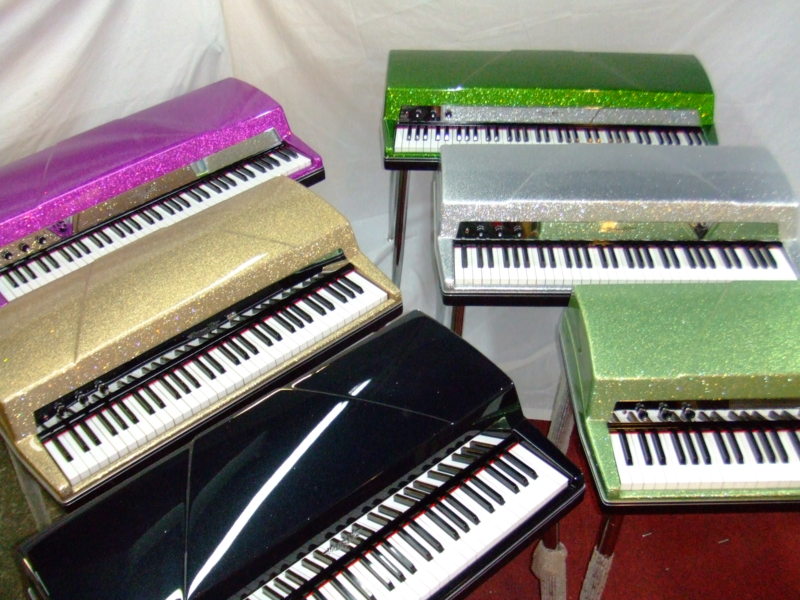 Fred DiLeone: The Rhodes Pre Piano, as parts are tough to come by, or early Wurlitzers. Models 110-112 can be tricky to voice, and the 120 (also 112A and 700) can be a nightmare! SB: Let?s talk about the Vintage Vibe Tine Piano. When and how did you have the idea of making a brand-new electric piano and what did the design process involve? CC: Fred is one of our main techs here and he and I used to work late at night repairing and refurbishing silver sparkle tops and other old Fender Rhodes. We would be drinking Coronas after a long day and he would talk to me about making a lighter piano. It was a great idea that he had a lot of dreams about. We just talked about it for a half a year until one day, I told him to show me something. He came in the next week with a prototype harp and action rail, the sparks of imagination flew and the rest is history as they say. FDL: I?ve been a gigging musician for many years, and found my sound in the early Fender Rhodes pianos? The ?golden years?, like ?71-?72. Lugging around a beast that weighs more than myself, I figured there MUST be a way to make these things lighter. Working those late nights on those early models with Chris, I started bouncing ideas off of him. I think it was the summer of 2009, I had brought in a Farfisa Combo Compact for repair. About a week later, Chris handed me the bill, which was heavily discounted. My ?homework? in return, was to build something out of those ideas I had. I brought in the prototype harp and action rail, and we immediately began designing various other components of the piano. There were more Coronas to be had, always lights. I would have preferred regular, but hey, free beer! SB: A certain other company is currently making tine-based pianos. Do you have any comments regarding their products? CC: I wish them all the success in the world, truly. The better they do is testament to the climate of the industry. They push many pianos out to dealers all over the world. We are making instruments one at a time and are happy with those numbers. We can keep the highest standard of quality to our customers. Our pianos take so long to build that we have a very long waiting list. It is something we want to improve but we need to grow the right way first. FDL: It?s a great thing to see companies producing ?real? instruments in the digital world. When you realise how much work goes into an electric piano -all of the components to be manufactured, assembly, setup, etc., it is very impressive. SB: When the first photos of the Vintage Vibe piano appeared, it came as a surprise to most of us. It was a while before we learned that it was electromechanical, tine-based and made from all-new parts. It?s a fantastic instrument, but might there also be a possibility one day of a reed-based version of your piano? CC: Yes – We basically have the model all designed, we just need the capital to get it going. The tine pianos have taken every penny the company has. Remember we are small and we operate with gratitude and contentment. We may show our reed prototype at this year NAMM. SB: Do you have any advice for people who either own vintage keyboards, would like to own them or want one of the new generation of retro instruments? CC: Yes, Take it seriously, learn about the instrument, learn what makes it tick, how to set it up and fix them. There is a whole new wave of piano players who have no idea about these pianos. The guys who played these in the 70?s and eighties knew what they were doing, they all took the responsibility on themselves and learned to do basic maintenance. We get the most basic questions everyday, I don?t mind answering questions for people, but when you own one and you have done absolutely no reading up on your instrument, it?s a disappointment for me. Today there is a treasure trove of written material and video on these instruments. To call up and ask how to tune a tine on a Fender Rhodes is lazy. Our Vintage Vibe pianos are like no existing Fender Rhodes you will find out there today. They are of the utmost in perfection. We painfully go over them until they are an absolute dream to play and listen to. New Pianos are not inexpensive due to the nature of time, parts and labour but to play one, you cannot put a price on it. We spend so much time perfecting each piano and we will not let them out the door until they have lived up to our standards. Usually this is way past any price we have sold it for. I would highly recommend anyone interested in a new piano to dive in and make the experience. It is a life long friend and companion that will give back to you multitudes more than you put into it, especially any monetary cost. FDL: There will always be respect for a ?real? instrument. Sure, samples have come a long way and there are many practical uses for workstations, but they are still a facsimile of the real thing. A sample will always fall victim to the programmer?s interpretation of any particular sound. The feel of a real piano can never be matched by the latest keyboard. As for the new generation of retro instruments, if electric piano is the main sound you?re looking for, go for the real deal. Initial cost seems to scare some people. Remember, these are not ?keyboards? banged out on an assembly line. These are pianos, hand built, set-up and regulated one at a time. Fifty years from now, they will still be serviceable, and valuable. Just try to find a replacement motherboard for your ten year old workstation! Chris put it best, ?a life long friend and companion?. SB: Chris and Fred, thank you very much for your time! Dieser Beitrag wurde vor am Montag, 29. August 2011 um 7:24 Uhr veröffentlicht und unter Interviews gespeichert. Sie können Kommentare zu diesem Eintrag über den RSS-2.0-Feed verfolgen. Sie können einen Kommentar hinterlassen, Pingbacks/Trackbacks sind momentan deaktiviert. Congrats too on your new blog. This is a fascinating interview. Being a non-keyboard player, I feel much like a non-sax player would talking or listening to sax players talking about their gear. I know Keys 101, but beyond that, I soak up what I can from wherever I can. Nice interview. So happy to hear that a reed based piano is on the horizon.